This Friday, thousands of hobbits will leave their holes to journey to The Hobbit: The Desolation of Smaug at midnight, making them very late for second breakfast in the morning. They have also already begun to get excited for the premiere, and the chance to hear Benedict Cumberbatch's sweet, sweet voice as Smaug. There have even been reports of Smaug appearing in full and in person on the side of a Air New Zealand jet. 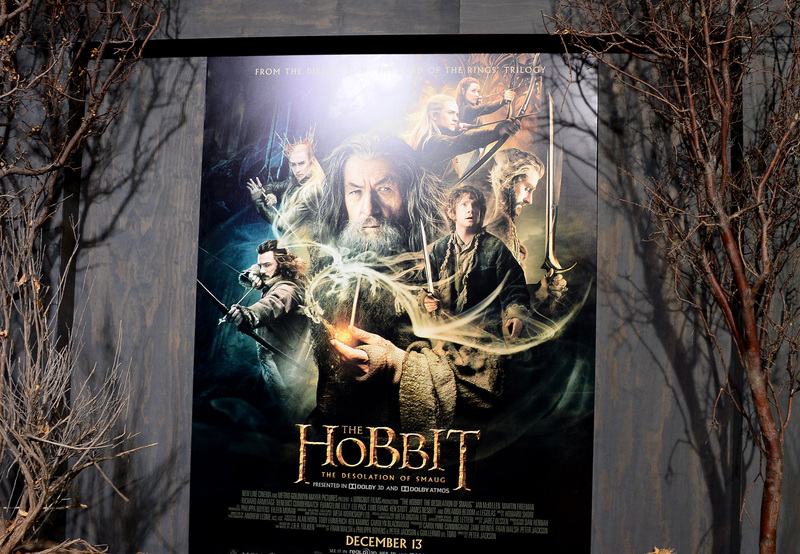 Even the critics seem tepidly excited for this installment of the three-part Hobbit saga. Many critics have said that this installment packs a much greater punch than The Unexpected Journey, and some have even said that there is more character development, which would certainly beat the first movie's flat wizards and dwarves. The reviews are thoroughly mixed, though, which seems fitting for a movie that covers around 100 pages of a children's book. And many die-hard hobbit groupies will be abstaining from the film because they still feel that three movies was excessive, but don't let them ruin your afternoon tea if you are one of the hobbits trekking to the film. In case you can't wait for The Hobbit (or if you're just bored while eating elevensies) here are the seven best Hobbit parodies and mashups. I have to award some props to The Hillywood show for truly making an unexpected parody of the first Hobbit movie. In this short, the dwarves' entrance into Bilbo's hobbit hole is turned into a music video for LMFAO's "Shots." This hilarious skit featuring Jennifer Lawrence mocks the fact that Peter Jackson split a children's book into three feature-length films. Try not to laugh at parts one through 18 of this fake preview. If you swoon over Elijah Wood and Harry Styles, this parody for is for you. Set to 1D's "One Thing," this video features Frodo, Bilbo, Gollum, Sam, and Gandolf singing and dancing around the One Ring. A warning, it's very catchy and has sing-a-long closed captioning, so you might find yourself whipping it out at karaoke sometime soon. Even Sesame Street has hopped on the Hobbit parody train with this kid-friendly parody of Lord of the Rings featuring Cookie Monster. Even if you're too old for Sesame Street, you will love this adorable tribute, and you might learn how to make chocolate chip cookies while you watch it. This hilarious spoof combines The Hunger Games and The Hobbit into one hilarious adventure, which will make you want to write Peeta/Bilbo crossover fan fiction. Not to spoil anything, but a third breakfast is involved. I won't lie, when I first found this parody, I watched it three times just to soak up the elven goodness. It's hilarious, it combines two awesome things, and it's really well animated.